Reception (Gallery 1C03): September 9, 2:00 - 4:00 p.m.
Artists' roundtable discussion (Room 2M71, 2nd floor of Manitoba Hall): September 30, 12:30 - 1:30 p.m.
NEW! Check out The Ephemerals' blog for regular updates on the project! In online social networking sites, the concept of `trending' demarcates a noted increase in the popularity of a specific thing or topic among a large group of internet users. In the wider world, a fashion trend indicates an upward shift of interest in a particular style or mode of dress by a number of people. A recent trend that has found its way into runway shows and suburban malls alike is an Indigenously-inspired look involving apparel such as leather mukluks, beaded headbands and feathered accessories. Clothing remains an important element within an Aboriginal art history as well as in contemporary creative culture where questions of appropriation and freedom of expression are beginning to erupt around this issue. Trending is a four-day performative embedment on The University of Winnipeg campus by The Ephemerals, an all-female Aboriginal collective of artists and curators. 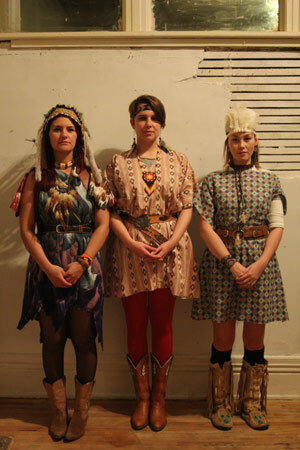 By inserting themselves into the university community, The Ephemerals will interrogate the trend of Indigenously-influenced clothing and accessories among post-secondary students, encouraging a critical reading of fashion as codified text and highlighting the need for a deeper awareness of its cultural implications. Images from performances and information related to the project will be uploaded to The Ephemerals' blog as the embedment progresses. Further supporting this project will be an ongoing intervention in the public display windows of the university's Anthropology Museum, drawing from and responding to the Anthropology Department's Ethnographic Collection. Additional affiliated programming will include a roundtable discussion with the artists, a public lecture and a public film screening. The Ephemerals is an emerging collective of Aboriginal women based in Winnipeg, Manitoba who are interested in curatorial and creative research. The collective was established by founding members Jaimie Isaac, Niki Little and Jenny Western to function as an outlet to foster and motivate artistic production within their individual practices and to develop collaborative projects that revolve around contemporary Indigenous art. Jaimie Isaac is an artist, curator and writer engaged in the arts on both a local and national level through her work with boards, collectives, juries and artist-run-centres. Isaac holds a Bachelor of in Art History of Art and an Arts and Cultural Management Certificate, both from The University of Winnipeg. She is currently a pursing a Master of Arts in Creative and Indigenous Studies at UBC Okanagan. Niki Little is an artist/observer who is interested in artistic and curatorial strategies that explore the reasoning of identity, culture and social exchanges. Little has studied at The University of Manitoba, the National Screen Institute and the Camberwell College of Art in London, UK. Jenny Western is a curator, writer and educator who holds an undergraduate degree in History from The University of Winnipeg and a Masters in Art History and Curatorial Practice from York University in Toronto. One of Western's recent projects includes co-curating Close Encounters: The Next 500 Years, a multi-venue group exhibition of contemporary Indigenous art from around the globe. Gallery 1C03 gratefully acknowledges financial assistance from The University of Winnipeg and the Manitoba Arts Council for this project. We are also grateful for the support of the Anthropology Department of The University of Winnipeg, the University of Winnipeg Students' Association and CKUW 95.9 FM.